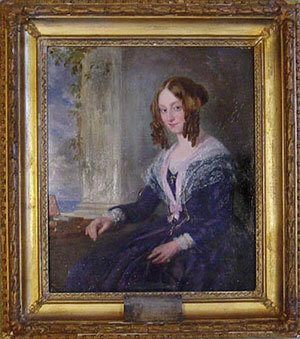 Elizabeth Barrett Browning, christened Elizabeth Barrett Moulton-Barrett, was born on March 6, 1806, into a wealthy family whose fortune came from Jamaican sugar plantations. Her childhood was spent very happily at Hope End, the family's stately home in Herefordshire, England. The eldest of twelve children, Elizabeth was something of a child prodigy; she was highly intelligent, dedicated, and determined to become a poet. She outclassed her brothers at Latin and Greek and could soon read in the modern languages of French, Italian, and Portuguese. By the age of twelve, Elizabeth had written an epic poem entitled The Battle of Marathon, which her father published privately in 1820. Although her brothers were sent away to school for their education, Elizabeth was required to actively pursue her studies through her brothers' tutors and her own initiative. She began an intense correspondence with Hugh Stuart Boyd, a blind scholar who specialized in ancient Greek writings. Loneliness, loss, and frustration perhaps predisposed her to physical illness--first a virus infection, then measles, and continuing spasms of pain and fever. She recovered after more than a year but was never again in robust health. She wrote poetry from her earliest years, but at the age of 20 she began to interest wider literary circles. After the death of her mother in 1828, there followed many years of suffering and misfortune with the deaths of brothers and a recurrence of her illness. Family disputes, adverse trading conditions, and the end of slavery reduced the Barretts' income so drastically that the stately home had to be sold. There was, however, enough wealth left to support a very comfortable lifestyle in a fashionable area of London, 50 Wimpole Street. Her reputation as a poet and critic grew while she retreated to her sick room, unable to breathe in London's polluted air. Then one day she allowed Robert Browning, as a fellow poet, to visit her—the rest, as they say, is history. She was a semi-invalid and nearly 40 years old when, surprisingly, Robert Browning was allowed to visit her sick room where they ultimately fell in love. Her widower father expected none of his children to marry, for they would be disinherited if they do so. But marry she did—secretly—and then the couple escaped to a life in Italy. Her father never communicated with her again. EBB's health recovered remarkably in the warmer, clearer air of Italy. At age 43 she gave birth to her first and only child, Pen Browning. She continued writing, completing her verse-novel Aurora Leigh at the age of 50. Gradually her illness overwhelmed her. She died in Casa Guidi on June 29, 1861, at the age of 55 and was buried in the old Protestant Cemetery in Florence, Italy.